As a warm up for the forthcoming tour to the UK, the Swiss U11 squad entered a team into the Basel U13 tournament and turned out winners! The Swiss U11s were drawn in Group B with Basel Dragons and Luxembourg. All their matches aside from the semi-final (12 overs) were 20 overs per innings. Andreas (ZCCC), Avneet (ZCCC), Connor (BDJCC), George (BDJCC), Kai (La Chat), Sai (BDJCC), Sasha (ZCCC) and Shankar (ZCCC) made up the team. After a hunt to find the Dreirosen school, the Swiss U11s were first up against a dangerous Basel Dragons side. Asked to bat first, Sasha (6) was out quickly poking at a ball from Charlie to Xander at point. George (13) and Kai consolidated, using the walls and calling well before George was hit on the back leg by Ali. Connor (8) managed a four before chipping Charlie to Ross. Shankar got going quickly, using the walls well. Kai retired brining Ryan (4) to the crease who hit one four before chipping Finlay to Ross. Sai (5) found the going tough before being bowled by Ross. Avneet (12) also found it tough to get runs but managed to find the wall four times before being run out by Charlie. Andreas (4) flickered briefly before he was also run out. Kai couldn’t add to his score before Finlay ran him out, leaving Shankar stranded. Connor opened the bowling and struggled with his line and length, but the team were sharp in the field and ensured no runs from the bat. Kai was quick and on target straight up and had Ali caught by Avneet second ball. Kai struck again in his second over when Ross chipped the ball back and Kai took it with a brilliant outstretched dive. Sasha then had Marshall caught by Connor. At this point Basel were a little behind the rate, and the Swiss team ensured they didn’t get close with tight bowling and fielding. Kai, George and Ryan all went for only three an over, and Ryan bowled Xander. Andreas’ off-spin only went for one run, and the pressure told with Avneet taking Alex and Charlie in the same over. George had Greg caught behind bringing back Finlay, who couldn’t do much before Shankar had him caught by George. Kai lost the next toss and were asked to field against Luxembourg. With back to back fielding, the team weren’t quite as sharp as the first match with bowling or fielding and Luxembourg got off to a decent start, with Charlie in particular able to score at a decent rate. Alec found it tougher and faced a number of dots before Connor bowled him. Ayush joined Charlie and kept the run rate at around 8 an over. They both retired, and Connor again struck having Leonardo caught by Avneet. Lydie quickly retired before Sai removed Malvina (bowled) and Oscar (caught & bowled) leaving Rebecca and Stella at the end. Unfortunately, George (1) ended up run out off his first ball, but Kai continued his hitting. Sasha (10) again looked in good touch but again was out cheaply. Connor (0) then chipped his first ball from Charlie to Malvina bringing Shankar out. He and Kai consolidated, and Shankar managed one 7 with overthrows. At this point Swiss U11 were ahead of the rate and started to feel comfortable. Ryan (17) came in for Kai and scored quickly before getting run out. Sai (6) also ended up run out. Avneet (4) found it difficult to score but remained at the crease. Andreas came in for the retiring Shankar but ended up caught, bringing Kai back. With plenty of overs, Kai and Avneet batted sensibly before Kai was caught with scores level. Shankar came back in and Lydie then attempted to run out Avneet at the non-strikers who was wandering out of his crease but decided to withdraw the appeal. Shankar scored the winning runs (needlessly running after the ball hit the wall) in the 18th over. Having won the group, the Swiss U11s faced the second place team in the other group, in a rerun of the previous year’s plate semi-final. As with the previous year, the Sapphires batted first. 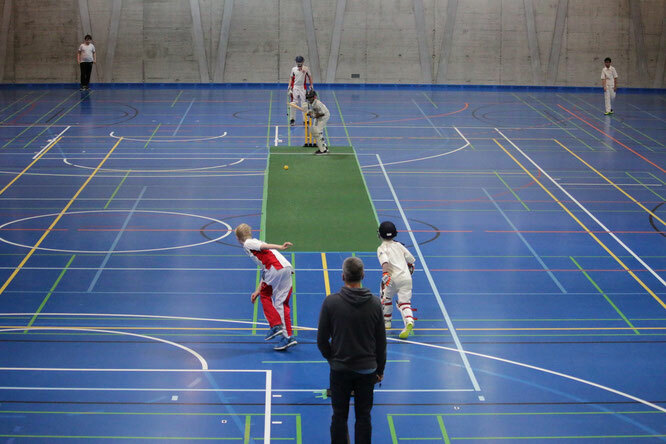 The Swiss U11s recalled their bowling and fielding performance from the day before and were exceptionally tight with the first runs from the bat coming at the end of the 3rd over. Andreas went for only 2 runs before Sasha got in on the action, first bowling Mansi and then running out Max (on loan from Gingins). Fin and Veena consolidated before Fin (also Gingins) was run out by Sasha. Veena was left stranded as Avneet had Melanie caught and then George bowled Maggie and then had Neha caught behind. Veena then ran out Asha (Sasha again!) to complete the innings. Connor was unlucky to be out first ball with Fin bowling a quick yorker. Sasha managed to go on this time, and he and Kai both managed a six, with Kai’s finishing the innings in 4.5 innings to send Swiss U11s into the final! Basel won their semi-final against Cossonay to setup a rematch for the first day. Sasha won the toss and decided to put a total on. After not being able to get a start, Connor was very watchful. Sasha at the other end was in destructive mood, getting a 4 off his first ball, and hitting a number of threes. He took a liking to Greg’s leg-spin, skipping down the track to hit him for a straight four and then a six to retire in 10 balls. Kai (19) continued his form before getting run out by Greg. George (12) found it more difficult to score but managed a 7 with overthrows before chipping Finlay to Rayan. Connor retired, and Shankar (26*) and Ryan (18) continued the scoring with Shankar retiring before Ryan was hit in front in the last over. Sai (6*) and Avneet (5*) used one of the balls to score a 5 to leave Swiss U11s on 208-3. Ross struggled to get Kai away and only managed a single off the first over, and Sai backed him up with quick bowling. The pressure told and Kai bowled Xander. Rayan followed soon after getting run out by Avneet. Ross tried his best, hitting a couple of fours and a six before Sasha had him hitting straight to Kai on the boundary. Marshall and Charlie struggled with the tight bowling and fielding and the required rate kept rising, with Basel on 55-3 at the half-way point. Marshall retired, bringing Greg to the crease, although he didn’t last long as he took on Connor and ended up run out. Charlie followed soon after, wandering out of his crease to Avneet’s bowling and Kai whipping off the bails. Ali and Alex tried to up the scoring rate before Ali was run out by George. Sasha’s figures took a denting as Ali and Finlay took him 16 in the 18th over, but Shankar knocked them both over in 3 balls leaving Marshall at the other end meaning the Swiss U11s won the title! For the team to come together and perform so well was a fantastic surprise. The previous year they performed well but lost both of their group stage matches and won the plate competition. This year the team as a whole performed in all aspects to win all their matches. It was also great to see the team gelling on and off the field. The team batted all the way down the order with many players getting decent totals at good strike rates, allowing the team to pass 200 for the first time! Sasha recovered from two soft dismissals on the Saturday to put in destructive and risk-free scores on the Sunday. Kai top scored for the team with quality innings, using the wall well. Shankar provided a crucial pivot in the middle order in all the matches and didn’t get out at all in his 3 innings. Bowling is normally a challenge at this level, but it was generally extremely tight, and a number went at under 7 an over. Andreas went wicketless but his off-spin was very troublesome. Kai and Sai formed a formidable quick bowling pair and George and Connor showed the benefit of bowling straight. Avneet was the top wicket-taker with his slower bowling and Shankar finished off a couple of innings. The fielding was sharp and accurate and even when mistakes happened the team backed each other up. Kai (one match) and Sasha (three) shared the captaincy and showed good leadership, with fielding positions and bowling changes as well as keeping their heads when runs were scored. Thanks to Antony for coaching and Jason for umpiring and scoring.